Why Choose Design Manager Over QuickBooks? "I have been using Design Manager for years at my design firm, V Starr Interiors, and highly recommend Design Manger to all design firms as it is a very useful tool to keep projects organized, and best of all it is extremely user friendly." "Design Manager keeps my team organized and running smoothly. It lets us focus on being creative rather than billing and project management." "After more than a decade in this industry, I simply could not run a business without Design Manager. My projects are highly detailed, and Design Manager serves as a database for all the minutiae while providing a straightforward platform for my amazing staff to place and track orders and easy-to-understand invoices for my clients. Beyond that, I’ve been very impressed with the immediacy and efficiency of its technical support. I would recommend Design Manager to any professional working in our field." 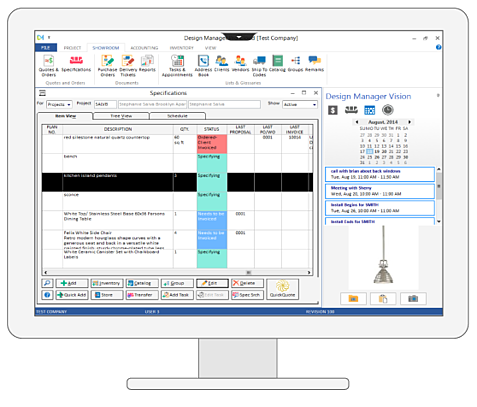 "The Design Manager software has been very effective in keeping my office organized. Switching to a software program designed specifically for the design industry has proven to be extremely valuable in managing the details, and therefore, has saved us time and money. I would highly recommend them to any interior design business." Not Convinced Design Manager is right for you? In Design Manager, you can add pictures of items to proposals and invoices so that your clients can see what you are purchasing. You can't add pictures to documents in QuickBooks. Design Manager has over 80 project reports - both for accounting and project management. QuickBooks has less than 60 accounting reports. Easily track your vendor orders with Design Manager. With Pro Cloud, you can even create custom item status colors so that you know at a glance whether your items have been ordered yet. Design Manager has project management made specifically for interior designers. Forget trying to make a generic software fit your custom business and get organized with Design Manager. QuickBooks does not have project management. After adding an item in Design Manager, you can generate proposals, purchase orders, and invoices all with the click of a button. In QuickBooks, you must reenter items for each document. Our tech support team knows interior design. They will not only be able to help you use the software, but they also understand your business.